The investigation of allegations of child abuse is a crucial stage in protecting children. Although other agencies will be involved in aspects of the investigation process the Police and Children and Young People’s Services (CYPS) are primarily responsible for the investigation. This Protocol is designed to help staff from the two agencies to work together. The Protocol will make reference to the formal investigative interview, but detailed knowledge of Achieving Best Evidence in Criminal Proceedings: Guidance on interviewing victims and witnesses, and guidance on using special measures, Ministry of Justice, March 2011 is a requirement for investigating officers. Although ABE is a practice guide for investigative interviews in the context of a possible criminal prosecution, the final outcome of the interview will not be known at the time. It should not be automatically assumed that every investigative interview would be recorded on DVD. If there is no possibility of criminal proceedings, a DVD interview should not be undertaken. (Case law (D v B and Others (Flawed Sexual Abuse Enquiry) (2006)) has established that even if a DVD interview is not appropriate, if there may be court proceedings under the Children Act 1989 – whether private or public law – there should still be a forensic interview following the ABE principles for interviewing young children). All investigations will be carefully planned to ensure that proper assessment, language needs and welfare issues are met. To ensure post enquiry intervention strategies are in place. Assessments should be undertaken by Children and Young People’s Services before the strategy discussion/ meeting. It should be noted that this assessment can be extremely brief if the criteria for initiating Section 47 enquires are met. All decisions about intervention levels should be made at the child protection strategy discussion or meeting between CYPS and the Police, including whether or not a single or joint child protection enquiry will take place. The Police will usually investigate extra-familial abuse allegations as single agency however; consultation should always take place with CYPS. This is particularly important where there are welfare concerns for the child or the child is in need of support and/or services. If the allegation relates to a professional person or someone in a position of trust, reference must be made to Working Together 2018 Chapter 2 – Organisational Responsibilities: Section 11 of the Children Act and the appropriate strategy discussion/ meeting must take place with the Area LADO (Local Authority Designated Officer). See also Chapter 8.3, Allegations Against Persons who Work with Children. The following tables set out example of types of referral and the interventions required by police and CYPS. Please note that any allegations which suggest that a crime has or may have been committed must be referred to the Police as they are responsible for recording this under the Home Office regulations. This will also enable indices checks as appropriate on Police databases. These examples are included for guidance, it is expected that decisions on wider cases will be made at strategy discussion. See also the Domestic Violence and Abuse Procedure. Allegation of sexual abuse upon a child A child makes an allegation of sexual abuse. For these types of sexual abuse referral the Police and Children and Young People’s Services (CYPS) will undertake a joint investigation with the police having the lead for the criminal investigation. Concern about symptoms of possible sexual assault A child is medically examined and found to have symptoms, which are suggestive of sexual abuse. The child does not make an allegation or is too young to do so. NB. In cases where the Police / CPS, following a joint investigation, do not feel there is sufficient evidence to prosecute this does not mean the case should not be followed up by CYPS as the burden of proof in civil processes is ‘reasonable cause to suspect’ and therefore much lower. Sexualised behaviour Report of a child simulating sexual activity by themselves or with others. CYPS will undertake enquiries as a single agency, unless there is additional information to indicate that a crime may have been committed. If a crime may have been committed, a child protection strategy discussion will be arranged and a joint investigation carried out between Police and CYPS, with the police having the lead for the criminal aspect of the investigation. Sexual abuse child upon child Report of two young persons (13 – 15 years) engaged in sexual activity. CYPS assessment will evaluate whether there is any information or evidence to indicate age, inappropriateness/ consent/ coercion/ exploitation. 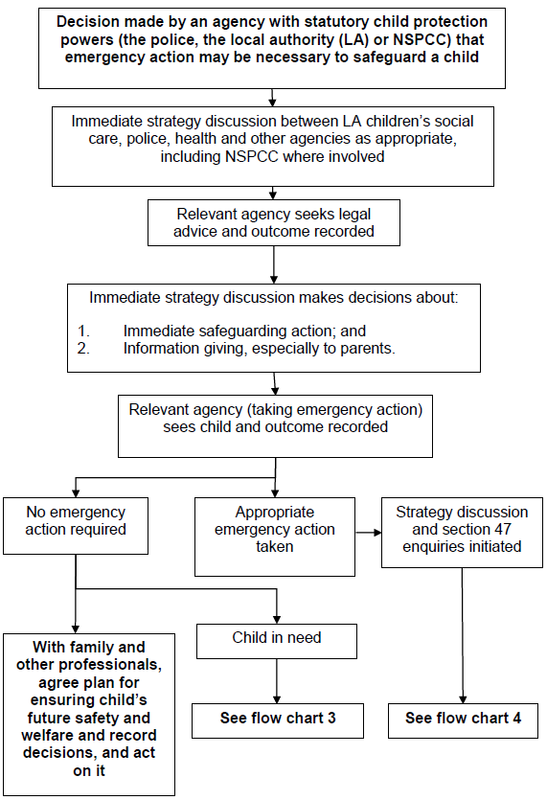 A child protection strategy discussion will take place between the Police and CYPS to decide if a child protection strategy meeting will be convened, in accordance with Norfolk Safeguarding Children Board (‘SCB’) child protection procedures, and in order to plan the appropriate level of intervention. Report of a 12 year old and 16 year old having sexual activity. If any children involved is under13 a joint investigation must be undertaken by the Police and CYPS, with the Police having the lead for the criminal aspect of the investigation. Grooming Children vulnerable to sexual exploitation. Children identified at risk of harm from any form of sexual exploitation (see theSafeguarding Children and Young People from Child Sexual Exploitation: Policy, Procedures and Guidance). Allegation of physical abuse. Allegation of physical abuse where a child has sustained an injury or there is a clear or likely medical diagnosis of physical abuse A child informs his/her teacher that a parent has been hitting him/her. There are no injuries reported by the child or observed by teacher and no indication of an implement being used. A child attends a hospital and is diagnosed with non-accidental injuries or is suspected of having non-accidental injuries, whether or not the child makes an allegation of abuse. In the absence of any additional information or evidence to suggest that the actions were over and above an act of reasonable punishment, CYPS should respond as a single agency. However, if further information and/or evidence emerges that a criminal offence may have been committed, a child protection strategy discussion/ meeting should be convened and a joint enquiry/investigation undertaken by the Police and CYPS, with the police having the lead for the criminal aspect of the investigation. Allegations of fabricated illness Paediatrician / Health Visitor have health concerns about repeated medical consultations where there is lack of evidence of symptoms described. Joint strategy meeting to include health professionals, education, Police & CYPS (health implications and responsibility). Reports of minor/low level neglect Report that a child is failing to thrive. CYPS to respond as single agency in collaboration with health professionals If during the CYPS Services/ Health intervention it becomes. Evident that the neglect constitutes Significant Harm and that a possible crime has taken place, the Police shall be informed and a child protection strategy discussion/ meeting convened. The Police and CYPS will undertake a joint investigation, with the Police having the lead for the criminal aspect of the investigation. Reports of immediate/ acute significant neglect The Police respond to an anonymous call and find a child locked in a house alone. The home conditions are considered to be detrimental to the child’s welfare and the child presents as being neglected and hungry. Non-school attendance/ lack of supervision. Strategy discussion – A joint investigation will be undertaken by the Police & CYPS, with the Police having the lead for the criminal aspect of the investigation. Reports of children suffering emotional abuse An anonymous call is received alleging that a child is being repeatedly verbally chastised at home. A child is present in the family home during an incident of domestic abuse that has warranted a child protection referral. CYPS will respond as a single agency but will ensure full joint agency checks carried out. Any delays by Police or Children & Young People’s Services in undertaking single or joint investigations must be recorded and reported to managers at senior levels. Where it is agreed that single agency enquiries will be made by Children & Young People’s Services, feedback must be provided to the Police before the case is closed. NB Please note that consideration should always be given to whether there is a risk to the life of a child or likelihood of serious immediate harm. In either case immediate protection (see Flowchart 2 – Working Together 2018) should take place. When it has been decided that a joint investigation will be undertaken, the CYPS Manager and the relevant Child Abuse Investigation Unit (CAIU) Detective Sergeant / Detective Inspector will plan the investigation and agree timescales and staff. Formal recording of the strategy meeting will be the responsibility of CYPS. The aim of the meeting/discussion is to agree objectives and individual roles within the investigation. The focus of the discussion is to make decisions on how the investigation will proceed. All investigations must be carefully planned and recorded, even in urgent situations. The discussion may be by way of a meeting for complex cases with the involvement of appropriate line managers or when the referral is straightforward, the discussion can be by telephone between the two agencies. If the allegation concerns multiple victim abuse, organised abuse or abuse in a residential setting, then a strategy meeting must be held as required under the Norfolk SCB Policies and Procedures. The allegations may be clear at the outset or may emerge during the investigation. The meetings will be minuted as open to disclosure in criminal proceedings. Allegation of sexual abuse where there is a risk of further abuse. NB – The criteria for enquiries at this stage is ‘reasonable cause to suspect’ and discussions in respect of these 3 categories should be made with this in mind. Whilst every effort should be made to consult with other relevant professionals before visiting a child, investigations should not be delayed if those staff are unavailable. Where referrals are received careful consideration should be given to whether an evening/ night visit should be made if this would involve waking up the child(ren). In most cases this would be inappropriate, but again the safety of the child(ren) must be the overriding consideration. Any DVD recorded interview of the child should take place as soon as possible. Any delay in the interview should only be in the interests of the child and the reasons recorded. Planning the actual interview with the child must be done by way of a meeting between the two investigating professionals. This should not be done over the telephone. Who should lead the interview. There are substantial grounds for suspecting abuse has occurred. In order to establish these criteria it will normally be necessary to have a short assessment prior to the interview meeting with the child. Please check ‘Achieving Best Evidence in Criminal Proceedings: Guidance on interviewing victims and witnesses, and guidance on using special measures, Ministry of Justice, March 2011, Part 2 Page 27 for purpose of the assessment prior to the interview. This document can also be accessed via the NSCB website. The assessment process should never replace or overshadow the substantive interview with the child. If there are concerns in respect of other siblings in the household, the issue of contamination of evidence will need to be addressed. Where unusual forms of abuse are suspected. Where the child has sufficient understanding, consent must always be obtained from the child and to enable consent to be given, adequate information must be given regarding the purpose of the interview. Refusal of consent must be respected however consent is not necessary from the child (although it unlikely to be practicable or desirable to record an interview with a reluctant or hostile child). Where a DVD recording is to be made the child must be informed about who may see the interview recording. Following the interview, if it is apparent that a criminal prosecution may follow and that the child will be required as a witness, then both the child and appropriate carers should be fully informed of the implications of such a course of action. At no point must a child, parent(s) or carer(s) be led to believe that the Court will not require the child’s oral evidence. It is generally presumed that the parents or carers of a child witness will be informed of any interview before it takes place; this presumption is independent of consent. In exceptional circumstances, however, it may be necessary to interview a suspected child victim without the knowledge of the parent or carer. Such circumstances include the possibility that a child would be threatened or otherwise coerced into silence; a strong likelihood that important evidence would be destroyed; or that the child in question did not wish the parent to be involved at that stage, and is competent to take that decision. Proceeding with the interview in the absence of parental knowledge needs to be carefully managed in interventions with the family by the local children’s services authority, but may be necessary for example where children are at risk of honour-based violence or forced marriage. In the majority of investigations it is expected that concerns will be shared with the parents/carers before the child is interviewed. This is after a child has been assessed and has disclosed that abuse has taken place. Parental consent is not required for the assessment process to take place. As a general rule information that a child is going to be interviewed should be shared with parents/carers unless to do so would affect the safety and welfare of the child or other children, or be detrimental to the criminal investigation. If a decision is made not to inform the parents/carer the reason must be recorded. The needs and safety of the child must be the first consideration when determining at what point parents/carers should be informed of the concerns and that their child is being/has been interviewed. The child should never be interviewed in the presence of an alleged or suspected perpetrator. (For further information – ‘Achieving Best Evidence in Criminal Proceedings: Guidance on interviewing victims and witnesses, and guidance on using special measures, Ministry of Justice, March 2011, Part 2 Page 19, section 2:40). Children who are being interviewed as witnesses may make a statement during the interview that implies they are also abusers or disclose they have committed other crimes. If a child victim appears to be a suspect during the course of an interview, a decision will have to be made on whether to proceed or terminate the interview. The interviewers should take a short break to consult on the matter. If it is concluded that the evidence of the child as suspect is paramount in a particular case, the interview should be terminated so that any further questioning can be carried out in accordance with the Police and Criminal Evidence Act 1984 guidance. (This may occur when dealing with an older child). A short debriefing between the interviewers will take place to evaluate information and evidence obtained. This debriefing may also involve line managers. Immediate decisions will need to be made in consultation with the responsible CYPS Manager, Social Worker and the Police CAIU Investigator. What action is necessary for the immediate protection of the child based on a risk assessment? What action, if any, is necessary to avoid the subject of the interview talking to other suspected witnesses before their interview is conducted? Decisions will be recorded utilising the Police CAIU database and the ‘Outcome Strategy’ form on the Children and Young People’s Services Compass database. Availability of a protective person – have they demonstrated a willingness/ability to protect? Any history of family violence? Any history of parenting and any previous concerns? What supportive networks are available? * Can the child take action to protect him/herself, (e.g. if an older child, or is the child afraid to return home)? There may be other relevant factors to consider in compiling assessment of risk – these are not exhaustive. It is important that the child’s views are taken into consideration and recorded. It is also important to be mindful of pressures to which children may be subjected. The child and family’s therapeutic needs. Identification of the responsible adult in relation to child witness pack. Police and Children’s services commit to deliver comprehensive training to all professionals undertaking joint ABE interviews.